IN STORE PICKUP ONLY! 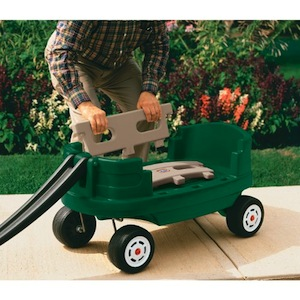 Roomy wagon has 2 extra-high sides that are removable for easy loading and unloading. Extra-long handle is comfortable to pull and folds flat for easy transport or storage. Caster front wheels enable a small turning radius to make it very maneuverable. Ages 1.5 years and up. Maximum weight limit 100 lbs. 2 children limit.